St Mary’s Roman Catholic Cathedral is a neo-gothic cathedral located in Perth, WA. It was constructed in four stages between 1865 and 2009. Building of the original brick portion of the cathedral commenced in 1863 but stalled due to lack of funds. 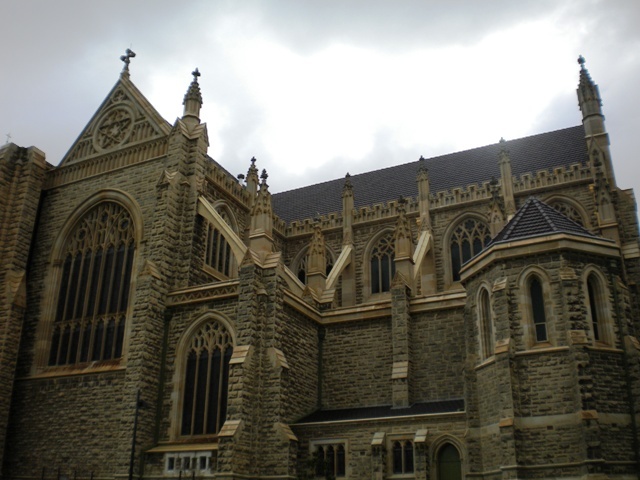 It was completed in 1865 when an evening procession of all the Catholic clergy in Perth was held, and the building was blessed and named the Cathedral of the Immaculate Conception. Additions and alterations between 1897 and 1905 emphasised the gothic character of the Cathedral. These included the addition of a steeple, pinnacles, gargoyles and crenellation to the bell tower, and the addition of a porch, an aedicule housing a statute of the Virgin Mary and extra lancet windows to the western end. Following the elevation of Perth to an Archdiocese in 1913, Archbishop Clune began a series of appeals to replace the Cathedral with a grander structure. Well-known WA architect Michael Cavanagh was appointed and produced plans for a completely new limestone Cathedral of Academic Gothic design. Due to financial constraints, however, it was decided to utilise the existing building, which subsequently became the nave, and add only new transepts and a sanctuary. These were completed in 1930 and the Cathedral retained this structure until 2006, when Archbishop Hickey ordered renovations to complete Cavanagh’s grand design. “St. 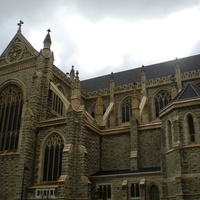 Mary's Cathedral, East Perth, 1865 Facade,” Medievalism in Australian Cultural Memory, accessed April 23, 2019, http://ausmed.arts.uwa.edu.au/items/show/10.